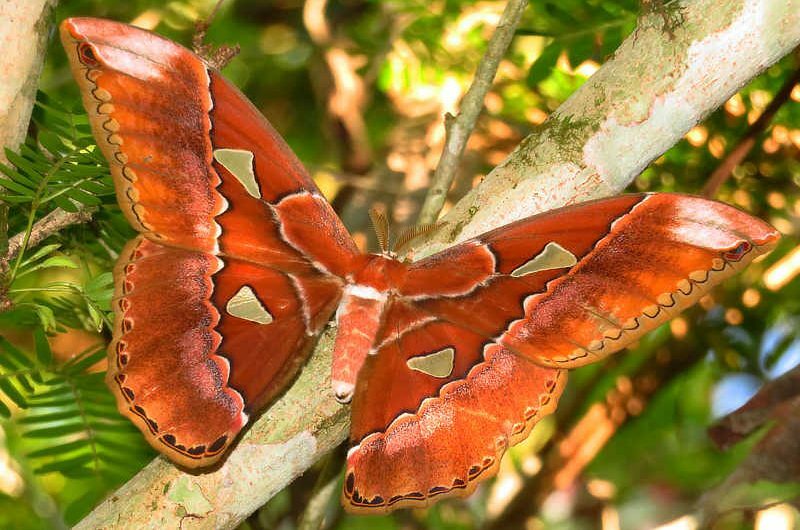 Rothschild’s Giant Silkmoths are among the largest and most beautiful of all moths. With a wide wingspan of 10-12 cm, they are approximately the size of a salad plate! Adult moths in the genus are distinguished by their large size, with transparent, triangular windows in each wing. Even as flashy, beautiful moths, they have various characteristics to assist with camouflage. The windows in the wings allow light to pass through, breaking up the wing profile and helping the moth avoid predation. Their wings also somewhat resemble a dry, decaying leaf with their cryptic patterns. Females have more rounded wings than males. Adults do not feed—after mating and laying eggs, their life’s function is fulfilled. Rothschildia triloba is a rainforest canopy species, found in the lowlands and foothills from sea level up to 1400 meters. It is found in middle and upper levels of the forest. It is more reddish and larger than other species in the genus found within the same range. It is widely adapted and can be found in a wide variety of habitats. Caterpillars are large and green with some countershading. They are difficult to find since they feed on a wide range of low-density species as host plants, including members of the families Anacardiaceae, Bursuraceae, Euphorbiaceae, Moraceae, Rosaceae, Rubiaceae, Saliaceae and many others. Larvae spin a dense pendant cocoon firmly bound to a twig with a long silk extension. Cocoons are sloppy in appearance, resembling a messy cluster of dead leaves, and are placed low in the understory of the forest, often just 1-2 meters above the ground to avoid predation by monkeys and birds. When the adults emerge from the cocoons, they seek out and mate that same night. Adults are found at very low density as well, likely less than one individual per square kilometer, and therefore rely very heavily on strong pheromones to locate their mates. The genus Rothschildia contains approximately 30 species and is exclusive to the Americas, with species found from the southern USA to Argentina. Rothschildia triloba is one of the most widespread species, found from south Texas to Brazil. They can be seen on occasion at the moth lights at the Canopy Family lodges, where they stir up exciting reactions from our guests! Old World Counterparts: Rothschildia moths are very similar in appearance to the giant Atlas moths and relatives (Attacus spp.) of Southeast Asia.